"Henry Busse Program 1935 - WBBM Music Remote"
Scary hairy ghosts, rich with the blood and gold of helpless humans! Smart 19th centurions specializing in the subjects of the property of matter, theory of heat, and acoustics, to say nothing of optics! Fred Astaire dancing on air! Laughs, drama, and variety! It's all here, and it's all eligible for Social Security the forgotten but not gone, rare 1930s old time radio shows! There's music galore - listen to the soft coos and old time jazz with the likes of The Four Ink Spots, singing melody and harmony on their own radio show, the music remote of The Henry Busse Program, and Hickory House Jam Session. Lend an ear to Thrills, the musical program starring Gayne Whitman and sponsored by Union Oil. Then gear yourself up for Melody and Madness, the comedy and music show that always starts with "Will someone please wake Benchley? This laugh-along and sing-along program stars Robert Benchley and Artie Shaw's Orchestra, then later Lennie Hayton. If your toe can't stop tapping, imagine how Fred must feel on The Packard Hour with Johnny Green, his piano and orchestra . This rare show broadcast in 1937 and starred Fred Astaire at the height of his toe tapping fame. Occasional interruptions by the 1936 presidential election ballot count make this show interesting and historical. Will Roosevelt win? Election jokes abound with Astaire, but between soft-shoe numbers of course. Haven't had enough historical political programming for your taste? Then tune in to The Townsend Movement, a political broadcast that promotes the Townsend Movement and its supporters, a program which helped get the ball rolling for social security. This particular two-part program features Sheridan Downey, the democrat nominee for the US Senate from California and "the only endorsed candidate for this organization. There is more adventure and drama ahead. 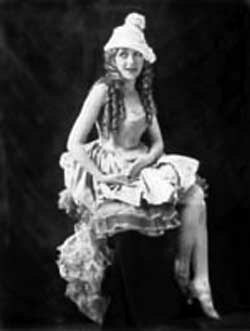 Mary Pickford (the "best known woman in the world) and Company star in the romantic comedy, "The Churchmouse. This dramatic program is Mary's first radio appearance, and sponsored by Royal Gelatin to boot. 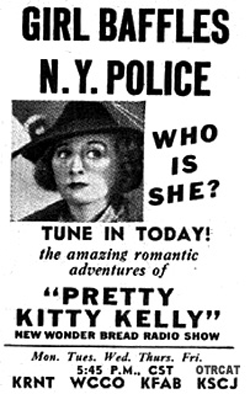 Then there is the exciting Pretty Kitty Kelly, an adventure show where Kitty is captured by Indians. If crime drama is your gumshoe, then Attorney at Law is a great dramatic program, one which held enough ears to sub for Fibber McGee and Molly in the summer of 1938. Variety highlights in this collection include Men of Vision, a show about men who have opened the eyes of the world. It is a show of dramatic highlights in lives of such men as Ben Franklin, Roger Bacon, and Galileo. One particular show focuses on the life and successes of Thomas Young, an early 19 th century philosopher, physician, archaeologist, linguist, mathematician, and founder of physiological optics. If that isn't a mouthful, then saunter on over to the saloon and listen to the tale of the Black Ghost. Mr. Ghost is an all-around mean-spirited ghoul, notorious for knocking over and robbing crippled men and taking their crutches. But that's not all! There are more 1930s rarities in this collection more laughs, spine tingles, rhythm, and adventure including The Mirth Parade starring Don Wilson- than you can shake a stick at. Most broadcasts were live during the 1930's because prerecording was expensive and unreliable. Happily for modern collectors, a few of the broadcasts were recorded for what were known as air-checks. An air check may have been made for the sponsor, or so that the station technicians could hear how the programs were being received. The air-checks would have been recorded using needle-scratch phonograph technology, a somewhat fragile technology in comparison with modern electronic recording. Not only were the recordings fragile, they took up physical space. Using modern MP3 technology, we can place dozens of programs on a single Compact Disc. These shows would have filled an entire closet in a broadcast studio. Fortunately, recordings from air-checks and other sources did survive. We are happy to present these orphan episodes in our Rarities Collections. Carroll Gibbons had a truly International career. Gibbons was born in Massachusetts, but moved to Great Britain in his teens to study at the Royal Academy of music. 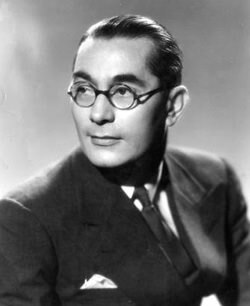 Although he did return to the U.S. for a few short periods, including working as a staff composer for MGM in Hollywood, England became his home. The broadcasts in our collection are from his weekly broadcast over Radio Luxembourg. The tiny country's location in central Europe was perfect to broadcast to all parts of Western Europe, and circumvent the British monopoly. Top Notchers, sponsored by Coca Cola (The Pause That Refreshes, even during the Great Depression!) presented popular music and sporting news as told by Grantland Rice. The Radio Guild was presented on the Blue Network as a sustained production which featured stories from great literature and one act plays. Smilin' Jack was a long running comic strip with an aviation theme. Hot pilot Smiling Jack Martin would foil the schemes of the bad guys with plenty of help from his friends, Dixie Lee the air hostess, his ward, the Hawaiian boy Fat Stuff, Rufus the Mechanic, and copilot Downwind Jaxon. The strip ran from 1933 until 1973, but the radio version only lasted the 1939 season. 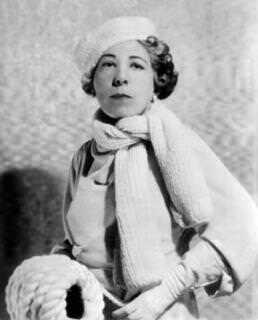 Edna Ferber's 1926 novel, Showboat, was an unlikely adaptation for the musical stage of the time. Although a troupe of entertainers sailing from town to town could have been light-hearted fare, the book explores serious themes of racial prejudice, infidelity, and acts of desperation. The musical adaptation is considered a watershed in American musical theater. Before Showboat, musicals were lighthearted revues, comedies and operettas. 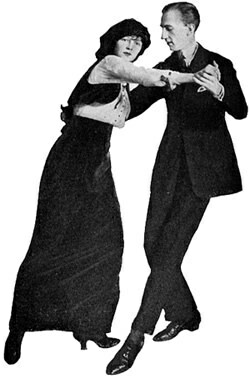 The Maxwell Showboat on the radio used some of the characters and situations from the novel and the musical for a radio variety program from 1934 until 1937. The revised program in 1940 placed more emphasis on light-hearted variety. The issues and artistic merit of the original musical made it a natural adaptation for Orson Welles' Campbell's Playhouse on Mar 31, 1939. Be the first to comment on "Rarities from the 1930s"